Apple HomeKit offers end to end encrypted security in control your HomeKit accessories. You may simply say "hey Siri" to unlock your iOS devices, to check your room temperature and humidity, or turn on/off the lights from anywhere. A scene can be simply set like "I'm Home". Notifications will be sent to your Apple devices if any movement is detected. This helps you monitor and remote control your HomeKit accessories to assist kids/elder people/pets at home. Low Energy Bluetooth allows up to 15,000 hours continuous operation. This battery powered motion sensor directly connects to your iOS deives without a hub, bridge or gateway. 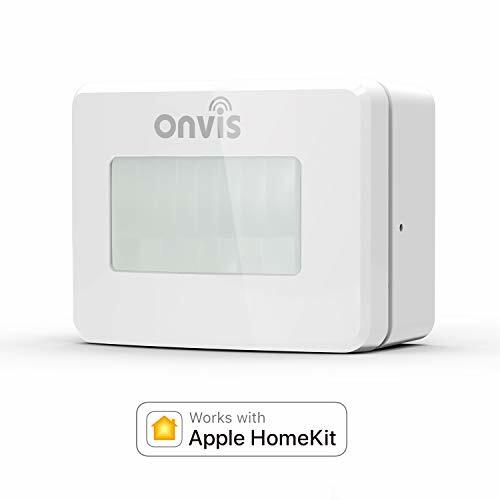 Easy Setup & Deployment Use Apple Home App or ONVIS Home App to scan the QR code to add ONVIS Smart Motion Sensor to your HomeKit Accessory. Deploy it anywhere you want by simply attach the back tape to the wall or ceiling or other surfaces.